Anonymous asks: Through most of history there were few clocks and only recently alarm clocks, so how did people know when to get up precisely? Or how did they schedule meetings or when to open up shop or close, etc.? Basically, I guess I’m just wondering how people kept track of time in order to go about managing daily life? As much as we hate the alarm that drags us from sleep to face the day, it is hard to imagine how people organized themselves and their collective activities before the invention and widespread use of mechanical or digital clocks. Clever and adaptable, we humans actually seem to have managed rather easily by relying on simple methods, some of which we still see in our timekeeping today. Universally, human timekeeping has always been related to the Sun and its movement across the sky. Ancient cultures, like the Babylonians, Chinese, Egyptians and Hindus, even from the earliest days of civilization were dividing the Sun’s cycle into periods. Of course, one of the drawbacks to this early way of keeping time was that, depending on the season, the length of each period could vary quite a bit. Another drawback was that at night the Sun was most unhelpfully missing from the sky, but Egyptians, like us, still needed to measure time. After all, how else would they know when the bars closed? To get around this problem, their astronomers observed a set of 36 stars, 18 of which they used to mark the passage of time after the Sun was down. Six of them would be used to mark the 3 hours of twilight on either side of the night and twelve then would be used to divide up the darkness into 12 equal parts. Later on, somewhere between 1550 and 1070 BC, this system was simplified to just use a set of 24 stars, of which 12 were used to mark the passage of time. The Babylonians used a similar system, and also had seasonally-adjusted hours, so that the Babylonian hour comprised 60 minutes only on the spring and fall equinoxes. 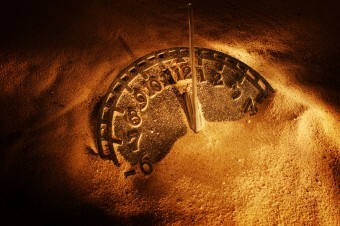 Sixty was important to the Babylonians, who inherited a base 60 calculation system from the Sumerians; ingenuous, 60 is a convenient number for doing math without a calculator since it is evenly divisible by each of the numbers 1 through 6, among others, and, most relevant to timekeeping, 12. Rather than using variable length hours, Greek astronomers in the 2nd century BC began using equal length hours in order to simplify the calculations when devising their theories and in experiments, although the practice did not become widespread until after the introduction of mechanical clocks; as such, regular folks continued to rely on seasonally-adjusted hours well until the middle ages. The impetus to develop mechanical clocks in Europe first arose among monks who needed accurate timekeeping in order to properly observe daily prayer, as well as maintain their rigid work schedules. The first recorded mechanical clock in medieval Europe was constructed in 996 in Magdeburg, Germany. By the 14th century, large mechanical clocks were being installed in churches across Europe, and the oldest surviving example, at Salisbury cathedral, dates to 1386. Innovation led to smaller clock parts, and the 15th century saw the appearance of domestic clocks, while personal timepieces were seen by the 16th. Note that, even well into the Renaissance, clocks did not display minutes, and the idea that an hour was divided into 60 of them was not well known until nearly the 17th century. So how did people keep appointments? One early method, practiced especially around the Equator, was to point at the place in the sky where the sun would be when you wanted to meet. A more common practice, particularly in the middle latitudes, was to rely on a sundial; all types proliferated and included everything from a simple stick shoved into the ground to the shadows that fell from landmarks (such as Egypt’s obelisks) to formally crafted devices. And, of course, advanced civilizations had a variety of other timekeepers as well, including water clocks and hourglasses, going all the way back to at least 1400-1500 BC. Of course, these methods were far less efficacious in extreme northern (or southern) latitudes. To accommodate their mercurial Sun, the Scandinavians invented daymarks – a system of dividing the horizon into eight sections, one each for north (midnight), south (midday), east (rise-measure), west (mid-evening), northeast (ótta), southeast (day-measure), southwest (undorn) and northwest (night-measure). The time of day was known by noting over which of these daymarks the Sun stood at that moment. On the other hand, some approaches were dependent on the kindness of others. In communities served by a sizable religious institution, residents could often rely on the ringing of church bells or the call to prayer. Likewise, when factories were first introduced in the 18th century, workers could depend on the factory whistle to get them where they needed to be on time. Later, as people moved further away from their employers, some paid Knockers-Up, early-risers who carried long sticks, to tap on their doors and windows at the appointed time. Remarkably, today’s ubiquitous, bedside, adjustable alarm clock did not become popular, at least in the United States, until the 1870s. How did people wake up in time in days before alarm clocks? Why is a minute divided into 60 seconds? My other answer is simple because they didn’t need and didn’t want to be slaved down to every minute like the modern society became – all we do is follow the clock, follow the clock, follow the clock. In their old times, they followed their own needs and meetings then, were called gatherings. Have you heard of roosters ? They are pretty good at calling you in the morning (and at other times too I’m afraid but that never bothered me). Other animals as also good time keeps, but not our indoors dogs nowadays….